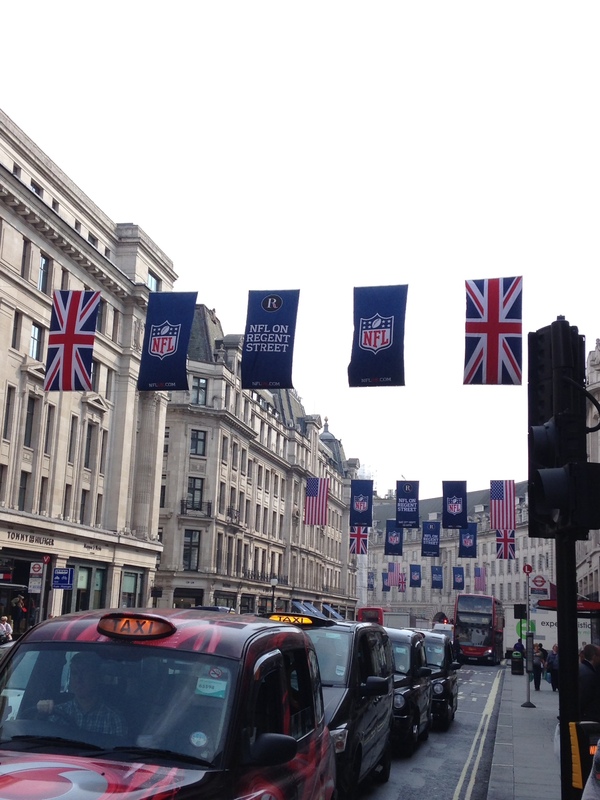 They might be more than 3000 miles from home, but the Detroit Lions are loving London living. Head coach Jim Caldwell addressed the media this morning and said his players were having a great time on their trip to the UK. The team are staying in the leafy Surrey surroundings of Pennyhill Park, near Bagshot. This luxurious hotel is where the England rugby union team set up camp during next month’s autumn internationals, and again for the 2015 World Cup. The Raiders used the complex in Week 4 last month, and The Jags were here last year. The Lions touched down in the UK on Tuesday, and Caldwell praised his hosts claiming that the trip has been great for team bonding. The Lions will shortly leave their country-living for the London metropolis, and Caldwell hopes that the experience will help the team on Sunday. There was a mood of optimism for UK football fans as Calvin Johnson took part in practice again. The receiver looked comfortable running routes with the offensive team, but Caldwell insisted his star man wouldn’t be rushed, “he did work yesterday and I thought he did a pretty good job. We’ll see where he is today”. Reggie Bush is also questionable to play on Sunday, along with TE Brandon Pettigrew. It remains unclear as to whether we’ll see Eric Ebron and Joseph Fauria as well. Both Atlanta and Detroit have embraced their visit this week and UK fans look like we’re in for a show on Sunday. 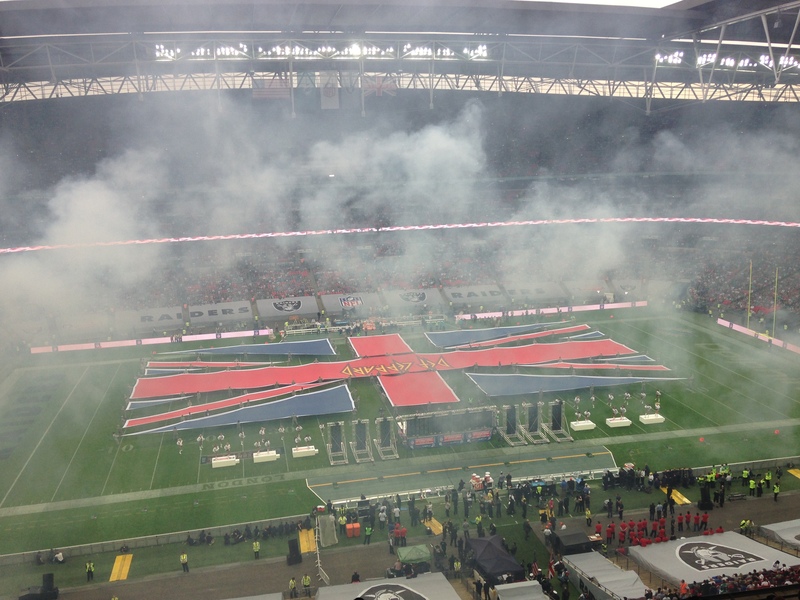 Will it be the Falcons flying home with the win, or will the Lions roar at Wembley? Whatever the result, we’re lucky to have them both over here. Oakland flew into London 0&3 but were buoyed by a promising performance at New England last week. Raiders fans had hoped to see their team clock up its first win of the season and things looked good as Derek Carr oversaw an impressive first drive that ended with a three yard touchdown to Brian Leonhardt. The Dolphins responded to that early blow by kicking a field goal and then the points kept coming. Ryan Tannehill found his groove and threw for 278 yards and two touchdowns. Not bad for a QB whose coach refused to comment on whether he was going to start him this week. By the end of the third quarter Miami saw themselves 38-7 up. The rookie Derek Carr threw for 146 yards, 1 TD and an interception before leaving the field in the third quarter with an injury. Matt McGloin took over and had a moment to forget on his second play as he watched the snap shoot past and picked up by Miami’s cornerback, Cortland Finnegan, who ran in the TD. The Raiders will fly back to California on Monday morning with question marks hanging over head coach Dennis Allen’s future. Although The Black Hole will be disappointed with their team’s performance under the arch, 83,000 football fans will have left Wembley satisfied with the event they experienced. NFL UK put on another festival that will further enhance this fine sport on our shores. There’s only four weeks until two of the NFC’s biggest shooters come to town with Megatron and Julio Jones whetting our appetites. Whenever you visit a different country it’s only natural that you take in some of their culture. That’s one of the reasons we enjoy travelling. The Oakland Raiders are no exception. After all, they’ve got a Brit in their ranks. So has Menelik Watson introduced his team mates to a bit of Coronation Street? If ever he wanted to show off a bit of the city where he grew up then this is the week to do it; with a spot of Corrie. 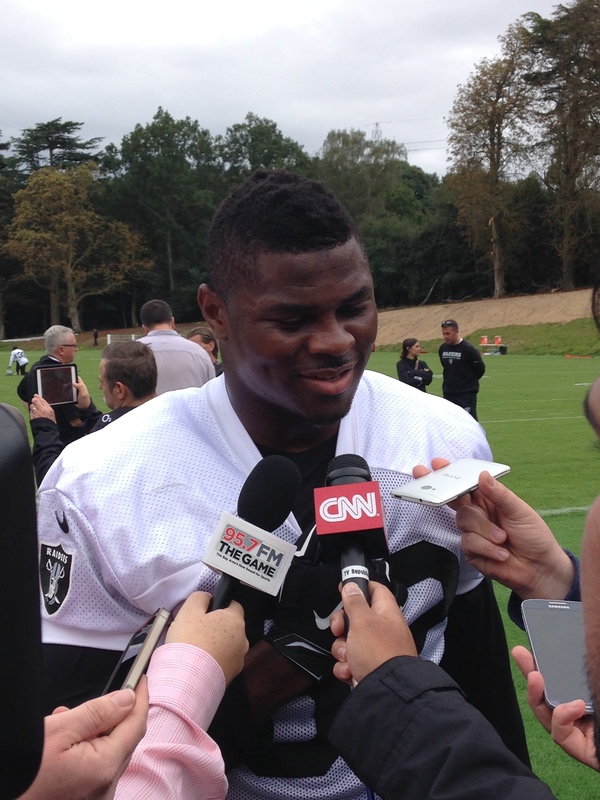 What about Khalil Mack? “No man, Menelik ain’t shown me around yet. He ain’t taken for no crumpets and tea or nothing, but I gotta get real quick with him after this”. The Raiders seem well adjusted to life in the UK and everyone I spoke to inn the team had nothing but praise for the welcome they’ve received since they arrived on Monday. They’ll want to repay that support with victory over the Miami Dolphins at Wembley this Sunday. This summer the NFL Commissioner, Roger Goodell, announced that a London franchise will happen in the next few years rather than decades. This is a hot topic with UK-based football fans who seem hungrier than ever for gridiron. Just look at the demand for tickets for this year’s International Series. Wembley hosts three games this autumn, the first of which takes place this weekend, and we snapped up tickets within a couple of weeks. So what do the Yanks make of it all? How do they feel about us Brits taking away one of their franchises? The former Super Bowl MVP, and two time Champion, Terrell Davis doesn’t have a problem with it. We caught up with him at the Raiders’ training camp in Surrey and asked him if he was impressed with the support for his beloved game over here, “Absolutely. You don’t think about the boundaries for American Football whilst you’re over there (USA) and how far it extends until you actually go some place and it’s actually being talked and being played there” said the former Broncos RB. Davis added, “I was walking down the streets and it was nice to see people talking about football and the game this Sunday. It doesn’t matter who’s playing, they’re into the game and that’s always good”. Davis said that it looks like a London team will happen, but questioned the impact the travelling would have on them every other week of the regular season, “you talk about jet lag, I’ll be interested to see the team that’s over here play 8 games in the States. It will be tricky, but what we’ve learned is that players are very resilient and they learn how to adapt to the environment. So whether it’s here or over there, you’ll probably hate the week but once the game starts nothing matters”. How do you resolve the issue of all that travelling? Davis has a solution – set up a whole new division with four UK teams! “The possibility of four teams over here is a solution. You put four teams over here”. His theory being that the teams would play more games over here, therefore only having to travel to the States a handful of times in the season. But is that what we want? I think part of the romance is being able to see likes of Rodgers, Brady, Manning and Megatron in our own backyard. 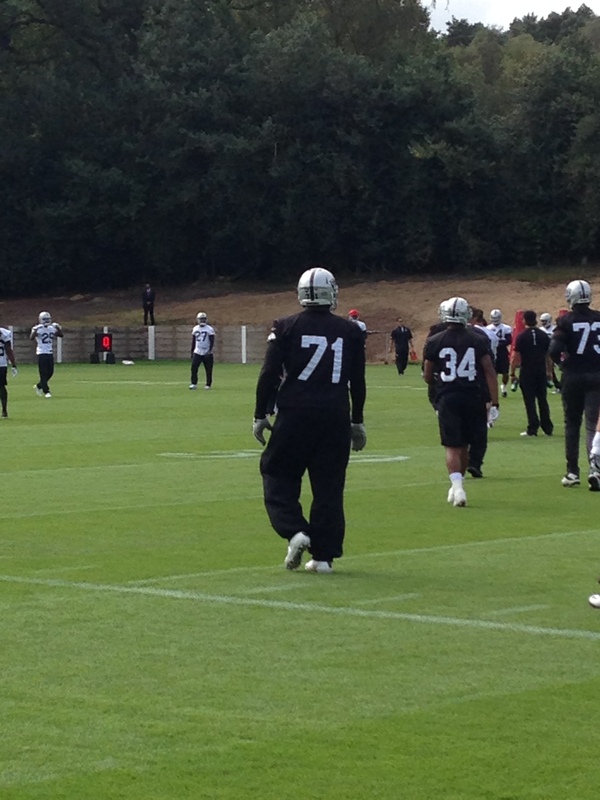 The Oakland Raiders (0&3) landed at Gatwick this morning ahead of their game versus Miami Dolphins (1&2) on Sunday. The Black Hole will take over Wembley Stadium this weekend. Will this be the week Derek Carr and co claim their first win? Will the UK crowd see their countryman, Menelik Watson, celebrate on his homecoming? 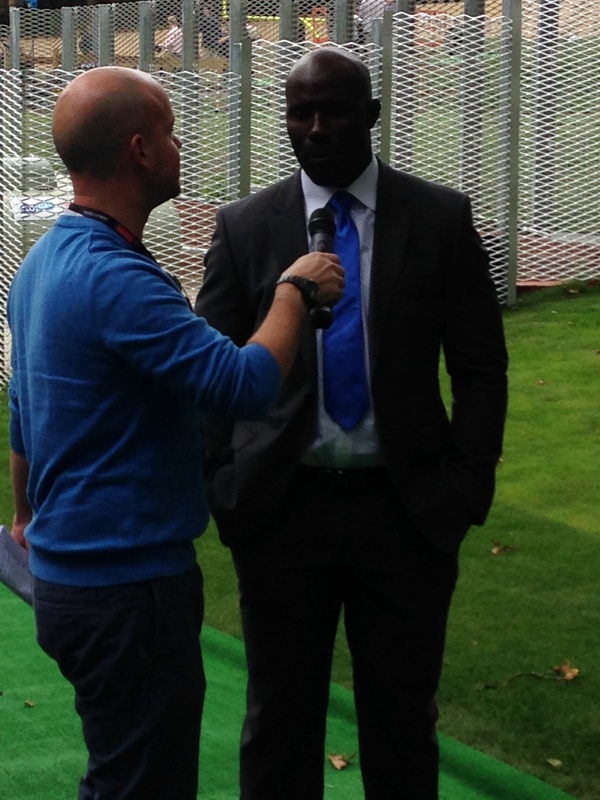 5th Down UK have been granted access to the team and we’ll bring you photos and interviews from the camp this week. Also, look out for us on Sunday and get yourself on our Wembley photo gallery! NFL merchandise – we love a bit of merch!